Grand Central Terminal is an amazingly beautiful building that deserves a visit for so many reasons, but one of the most fun reasons is the Whisper Tunnel. 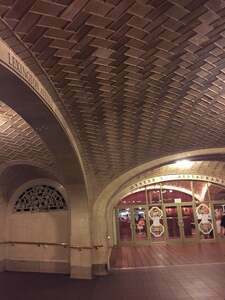 Located right outside The Oyster Bar is an interesting area with great tiles and arches. If you stand in looking into the corner and a friend stands opposite you looking into the corner, you can hear each others whispers. Beautiful, fun and right next to a classic NYC restaurant. How could you not want to try it out?